Welcome to those of you joining me from Frontierland Station and those of you just hopping aboard. I am the final stop on our Magical Blogorail. When I first stepped foot in the Disney online community back in 2007, one of the first podcasts I began listening to was WDW Radio. Since then I have been an avid listener and supporter of the WDW Radio host, Mr. Lou Mongello. Not only has Lou’s show won Best Travel Podcast every year from 2006-2013, but he also is an author. The Walt Disney World Trivia Books (there are two volumes currently) take trivia about Walt Disney World and turn that into fun for the whole family. More about WDW Radio, The Walt Disney World Trivia Books, and Lou’s popular Audio Guides and Dream Team Project can all be found at WDW Radio. So I have “known” Lou for many years and when I saw that his new project was a book about saving money at Walt Disney World, I couldn’t wait to take a look at it. 102 Ways to Save Money for and at Walt Disney World gives answers to that pesky question most people traveling to WDW have: how do I afford to pay for a WDW vacation? Not only is this question answered, but it is answered with so much variety that any person who thinks WDW is out of the question for a vacation due to finances will seriously reconsider staying at home. 102 Ways to Save Money for and at Walt Disney World can be found at Lou’s website and is offered in digital form as well as paperback. I knew that I didn’t know everything about saving money at Disney World and for Disney World, but I didn’t realize just how much I didn’t know. Reading this text was a journey through the mind of a true Disney “life hacker.” The tips begin not as you step on property, but months (or even years!) ahead of your travel dates. Lou meticulously explains tips that might be obvious: saving for a trip, booking a room, how to dine, etc. to the obscure: partial day tickets, laundry problems, pressed pennies, etc. What I love about the book is the dedication to details and the feeling that every stone has been upturned for you. 102 Ways is separated into obvious sections of the vacation planning process. For instance, the chapter that includes when to book a hotel room comes before the chapter on dining. Also every chapter in the digital version offers links to online content that coincides to the tip in question. My favorite part of this service is that Lou lists the episodes of his podcast that match the tip. As I was reading, I tried to see just how many tips you could use out of the 102 on one single trip. This I found impossible, but that was the beauty of the text, because the variety of tips gives everyone reading, no matter the background or financial level, the opportunity to save money (and much more than a few dollars) when traveling to the Disney parks in Orlando. The book is easy to read and is great as a reference for any and all decisions in the vacation planning process. Two mouse ears way up for 102 Ways to Save Money for and at Walt Disney World! While reading 102 Ways, I continued to audibly say, “oh thats a good idea,” and “wow, I never thought of that!” Of course there were many tips that I knew about, but I am sure the typical traveler would probably never know without someone telling them. No matter if it was a new idea or a known tip to me, this book organized and categorized them neatly in one volume for me. Lou Mongello’s new book 102 Ways to Save Money for and at Walt Disney World is a great read and very worth the cost. Not only does the book contain details for each of the 102 tips, but it also includes 40 ideas of free things to do or have at WDW as well. If you a Disney fan like myself this is a great addition to your Disney travel collection. Check out our Magical Blogorail competition to win your own copy for free below! At that moment I was completely lost in the world of Middle-Earth. And I would continue to be for the next few months as my father read me this story. I remember the spiders, Gollum, Beorn, the Trolls, and of course The Battle of Five Armies. Also the death of two of my favorite characters was the first time a book truly made me cry. It was around that same time that my father told me about Star Wars. I remember watching the first movie at our old apartment that we lived in while my parents current house was being built. Again I was opened to a whole new world of adventure and good vs. evil. I could feel myself using the Force to move things and I WAS Luke Skywalker and lets me honest, every kid took a stick/light saber and made the noises while we fought enemy Stormtroopers. The very next night we watched The Empire Strikes Back and the ending was the biggest shock of my life. I don’t think I have ever freaked out at a movie more than when those famous words were spoken. We hesitated for a few months before watching Return of the Jedi, solely because my dad told me you saw Darth Vader’s face at the end and I was really not ready for that. I had nightmares about it. But these were the days of VHS recordings and our whole trilogy of Star Wars movies were recorded from HBO. So when we actually did watch Return of the Jedi the recording cut out before I saw Darth’s face. It took quite a few more years before I did and yeah it wasn’t so bad. Why do I tell these stories? Well most everywhere on the interwebs on Sunday there will be Father’s Day posts. People will change their profile pictures to them and their dads, they will post great stories like the ones I tried to tell well above, and most of all people will eat Sunday lunch or dinner with their dads and then give him a giftcard, tool, or some other item of the manly persuasion. 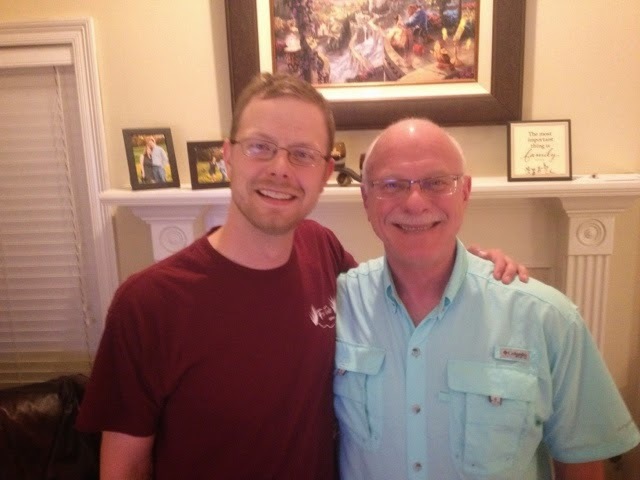 I can’t be with my dad this year on Father’s Day because I will be at camp with our youth group, out in the middle of nowhere Mississippi, enjoying the fun and festivities that come with summer camp. how to grill the perfect burger, how to play poker, how to swing a golf club, and thats really only getting started. He also helped to teach me how to give your time at a church, how to use your connections to help others in need, how to lose and win gracefully and with the highest sportsmanship (this is referring to our love of Mississippi State NOT card games, where my dad is an avid cheater:), how to appreciate the smallest of things in life, and how to use your talents for others. But one of the greatest gifts that my dad gave me was not in the above list, in fact, it is something that not many sons can say their dad did for them. My dad showed me that cancer could be beaten. 15 years before I was diagnosed with Hodgkin Lymphoma Stage 2B, my father was diagnosed with the same disease, same stage. Because of the advancements of research and medicine my dad’s struggle was a lot worse 15 years ago than my struggle this year. But the point is that when I was diagnosed, I was not afraid of cancer, because I knew it could be beaten. Also I had faith that God would deliver me from it and if not, I would praise Him anyway. My dad brought me up to give back and that is why he is running a half-marathon in my honor in January. And because my dad knows me he is running the Walt Disney World Half-marathon. So because I want to give back too we are both running as are our famillies. We run to give back to the Leukemia Lymphoma Society and help the next generation of cancer patients realize that dragons can be beaten. So thanks dad, for teaching me how to love Bluegrass, a furry footed hobbit, Jedi, Bulldogs, family, God, and a good grilled burger. And thanks dad for beating cancer and for loving me, while I did the same. Happy Father’s Day.